Inspection Certification Associate’s online Real Estate Inspection Certification Program is the most comprehensive and effective home inspection training available anywhere. Using laptops, desktops, tablets and iOS or Android smartphones, students complete the classwork at their own pace. Each of the 28 streaming video home inspector training sessions is narrated by an instructor who is a home inspection industry professional. All students and graduates have lifetime access to ICA’s extensive online library of home inspection e-books and other materials. Our home inspector training course also includes professional home inspection report software, which lets home inspectors complete their reports on smartphones or tablets. Home Inspection Classes Online – Learn From the Experts! All home inspection training materials are available online 24/7, which allows you to proceed at your own pace. Using a tablet or other digital device, the classes can be taken any time that’s convenient and anywhere there’s an Internet connection available. As part of your $695 tuition you will receive “Report Form 2” from Home Inspection Report LLC. This is a $399 value included! And there is no catch. There aren’t any activation or on-going fees either. You can generate home inspection reports from an iPad, iPhone, Android or personal computer. The course also contains our 2 “Supercharged Marketing” courses. You get 8 hours of specific home inspection marketing techniques to build and grow your business. This includes “The Focused Marketing Plan”, social media marketing, grassroots marketing, micro-marketing, performance marketing, direct mailing marketing and daily business marketing, just to name a few. If you planning on starting your own home inspection business, these courses are a must. As an added bonus all ICA Home Inspection Course students also receive a free lifetime listing on www.hireaninspector.com, which is a website where real estate agents and homebuyers go to find certified home inspectors. This is a tremendous value as hundreds of qualified home inspectors pay $200 per year to be listed there. Our instructors are always available to help. Whether you’re an ICA home inspection training student or graduate or are interested in finding out more about a career as a professional home inspector, call us toll-free at 888-374-4096. We’ll be pleased to answer your questions. ICA’s courses cover a broad range of topics that most of our competitors don’t. Examples are classes on inspecting commercial buildings and using drones to check out rooftops during inspections. We also provide more than 20 downloadable e-books covering diverse topics such as energy audits and termite inspections. Different from most other home inspection training programs, our graduates have lifetime access to all ICA courses and materials. 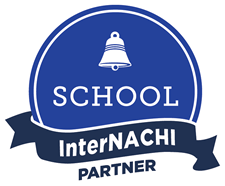 All ICA home inspection graduates are also eligible for a free one-year membership to InterNACHI ($499 value) which provides free home inspector continuing education and mentorship. By completing the home inspection training online with Inspection Certificate Associates, you will fulfill the home inspection training requirements in nearly every state. Not only will our course prepare you to obtain your home inspection license, it will also equip you for the real world. Don’t just take our word for it, take a listen below to what some of our customers have to say. You can also view more testimonials here. Unlike some other home inspection training schools, our course materials are consistently updated to include the latest guidelines and techniques. To compare Inspection Certification Associates’ services and benefits with those of some of our competitors, click here. When you complete Inspector Certification Associates’ online home inspector training, you’ll have met the home inspector training requirements for just about every state across the country (see State Licensing). You’ll also be qualified to begin conducting real life home inspections. But don’t just take our word for it. See what some of our graduates say about ICA home inspection training. Enroll today in ICA’s fast and affordable online home inspector training program to get started on your way to an exciting and rewarding new career as a certified home inspector! Still have questions? Call us at 888-374-4096 or check the FAQs below. How Much Does a Home Inspector Make? According to the U.S. Bureau of Labor Statistics, the median annual pay for all home inspectors in 2017 was approximately $76,000. The highest 10% brought in more than $120,000 annually. There are several factors that affect a home inspector’s earnings, including the area of the country where the inspector is located, years of experience and whether the inspector is self-employed or works for an inspection company. Other items affecting earning are the types of services offered and whether the inspector works part- or full-time. What Do I Need to Become a Home Inspector? Requirements for becoming a home inspector vary by geographic area. Some states, such as Colorado and Wyoming don’t require home inspectors to be licensed. It’s likely, however, that customers in these states will want verification that an inspector they’re considering hiring has been properly trained and certified. Check your state to see if a license is needed in your area and if there are any additional requirements. You’ll also need strong interpersonal skills, since building long-term relationships with clients, realtors, lenders and others who can send your business is crucial to your success as a home inspector. Do I Need a Construction Background? Contrary to what many people think, construction experience isn’t necessary to become a successful home inspector. A background in construction, engineering, architecture or related fields can, however, be helpful, especially to newly certified inspectors who are just starting out. Lack of construction experience shouldn’t keep you from becoming a home inspector. Men and women of all ages and backgrounds have succeeded as inspectors through hard work, determination and a willingness to learn. You’ll gain much of what you need to know through your home inspector training classes. The rest will come from “hands-on” experience conducting home inspections. How Can I Become a Home Inspector? A career as a certified home inspector begins with proper training. It’s important to choose the right school, since not all training programs cover the same topics. There are many schools that offer home inspector training and certification, although not all programs provide the same level of instruction. 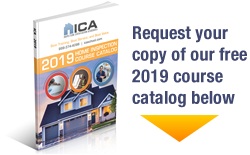 ICA’s Home Inspector Training and Certification covers everything from foundations and footings to rafters and rooftops and everything in between, including plumbing, electrical and heating and air conditioning systems. Read about why you should choose ICA for your home inspection training and certification. There are no time limits for completing ICA’s Training and Certification Program. Students work at their own pace, and since all training materials are available online 24/7, you can complete your training any time and anywhere there’s an Internet connection. This flexibility lets students continue to work at their current jobs until the training is completed and they’re ready to begin their new careers as professional home inspectors. Most students finish the course in three to four weeks, although some complete the training in two week or less.